I believe there is some sort of made-up word for when you go to get a snack from the refrigerator, and you can’t find anything. However, you still go back to it, as if something will materialize. Of course, you realize that it costs precious energy and money to stand in front of an open refrigerator door. So why not make it transparent? This conceptional refrigerator by designer Yoon jung Kim and Jong rok Lee has some special glass in it that is normally opaque. However, if you run a current through it, it will turn transparent. I’m not at all certain if this will work, as I have never seen glass like that before. 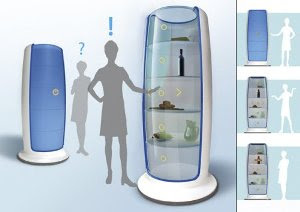 I’m not doubting that this could work, but if we have glass that can go from transparent to opaque, then we really need to use it on more than just refrigerators. In addition to that glass trick, this Window Fridge has another outstanding and unique feature: sections. That’s right, this refrigerator doesn’t just have one or two doors, but many. So if you want to categorize your foods, and sort them by the five compartment doors, then you can. Well, there is no word when this fridge is going to be actually made. Perhaps the designers need to perfect this glass going transparent or opaque thing.